When reading articles on climate change, you often come across difficult terminology. The terminology might be confusing even to the leading climate change and energy experts, let alone a person, who is only just getting interested in the theme. To help tackle the subject, the climate secretariat of Russian Social Ecological Union (RSEU) launches a series of articles under the heading “Complicated Things Explained Simply”. 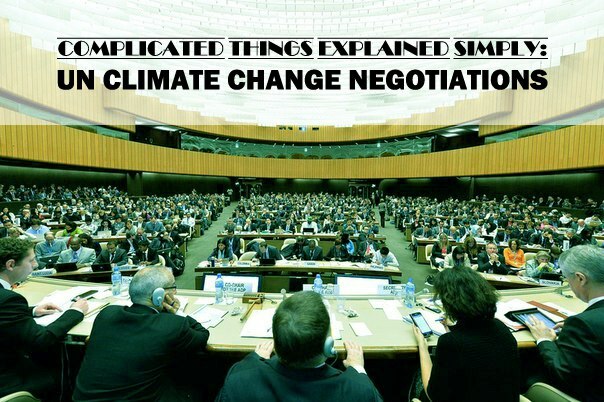 In the opening article, we try to understand the UN climate change negotiations process. In 1992 in Rio de Janeiro, 180 countries signed the United Nations Framework Convention on Climate Change (UN FCCC). It was signed by all the Post-Soviet states and the industrially developed countries. The convention states the common principles of taking action against climate change. Since then, the signing parties have gathered every year to negotiate on how to reduce human impact on the climate and how to adapt to the already felt consequences of the impending global catastrophe. These meetings are called Conference of Parties (COP). Each year the negotiations are held in a different country and identified with an ordinal number. The previous conference in 2014, COP-20, was held in Lima, Peru, and in December this year, COP-21 will take place in Paris. Many different international agreements and documents have been adopted in the frameworks of the UN climate change negotiation process. One of the most significant of these treaties is the Kyoto Protocol. During the first commitment period, 2008–2012, many international projects that introduced renewable energy and energy efficiency were carried out, especially in the developing countries. The protocol boosted technology transfer from developed economies to the developing ones. According to the preliminary estimations, those countries, who committed to the Kyoto Protocol, reduced their greenhouse gas emissions more than 20%, which is considerably more than the set goal – emission reductions of 5%. However, there were many shortcomings in the Kyoto Protocol, and it wasn’t ratified by all countries, for example by major emitters such as USA and Canada. In the second commitment period (2012–2020), even fewer countries are committed to binding targets, and the emissions of the ones that are, represent only 15% of total global emissions – therefore the second period of the Kyoto Protocol will not be very efficient. The planet calls for a new agreement in 2020 that will succeed in making countries join their forces to reduce emissions and adapt to climate change. Exactly this goal in mind, all countries of the world will gather in Paris in December 2015 for COP-21. In Paris the goal is to reach a comprehensive agreement to limit the global warming at 2°C over the pre-industrial average (between 1880 and 2012 the global average temperature rose 0,85°C). Olga Senova, head of the climate secretariat of Russian Social Ecological Union, doesn’t consider the negotiation process very effective. It is already clear, that in Paris in December 2015, a judicially binding agreement between all countries will not be reached. More and more climate actions will go in the category of “voluntary contributions” or intentions. But that is no reason to quit, but instead a challenge for all the parties to prepare an agreement that is as concrete, binding and effective as possible. It is a challenge also for the citizens around the world to express their wants and to demand responsible actions from their negotiation delegations. Every year before the approaching negotiations RSEU turns to the leaders of the country with their Position, which states that it is absolutely necessary to take active measures against climate change in Russia, and that Russia must also take an active, responsible role in the international climate agreement. How can the world’s countries reach an understanding on the collective actions against climate change? We will discuss the different negotiation mechanisms in the following articles included in the series “Complicated Things Explained Simply”.